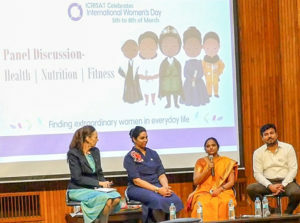 Women scientists at ICRISAT expressed their hopes and highlighted their struggles in their area of work in a series of videos called “What it’s like to be a woman working in science”. Watch here. 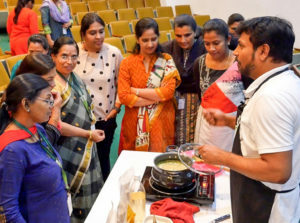 At ICRISAT-India, we celebrated with a week of activities with a workshop to empower self-beliefs; a self-defense training session; a panel discussion titled Health| Nutrition| Fitness; and a cooking show underlining millet as a source of nutrition and diversified food choices. 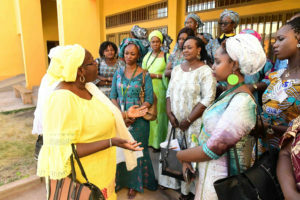 In Bamako, Mali, the ICRISAT Women’s Forum discussed (i) Development plans for women’s scientific careers as well as work-life balance and (ii) Women’s contributions to the UN Sustainable Development Goals – especially SDGs 1 (Zero Hunger) and 5 (Gender equality). At the Lycée Notre Dame du Niger college for Girls, Bamako, the Women’s Forum held inspiring discussions on women in science, with many Forum members sharing their experiences as women scientists in today’s world. They then spent time at Pouponnière, a center for abandoned children and orphans, where they also donated cereals and groundnut flour ‘Misola’ prepared by a women’s association and ICRISAT partner in Kolokani. Women’s Forum members at a children’s center. Finally, the Women’s Forum paid a visit to the Bollé Center for Female Detention, Reeducation and Reintegration. The Center asked for assistance in reopening their ‘Agropastoral Unit’ which has been closed down due to lack of resources. 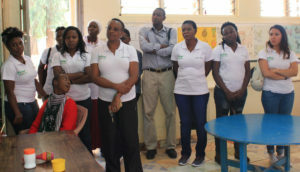 In Kenya, visiting schoolchildren suffering from cerebral palsy, women staff from ICRISAT-Nairobi learnt about inclusive diversity, targeting of effort and meeting community needs. To underscore the important event, Dr Peter Carberry, Director, CGIAR Research Program on Grain Legumes and Dryland Cereals, delivered a poignant message and stressed on going beyond diagnosis to transforming women’s lives in drylands. He spoke on how the gender perspective is embedded in the research design, planning and outcomes. Watch his video message here. All in all, it was an eventful and insightful couple of days of celebrating women, their achievements, challenges and aspirations, across the world in India as well as Africa. 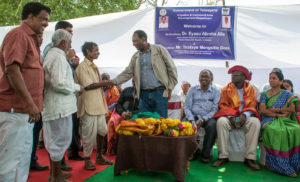 HE Abraha Alle interacts with a local farmer. 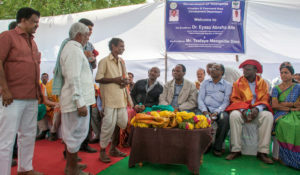 A high-level ministerial delegation from Ethiopia recently visited India to observe and learn from best practices in dryland agriculture, rainwater conservation techniques and agribusiness development. The visit was facilitated by ICRISAT to strengthen partnership and knowledge sharing between the two countries that have similar climates, landscapes and agricultural practices. His Excellency Eyasu Abraha Alle, Cabinet Minister, Ministry of Agriculture and Natural Resources (MoANR) of the Federal Republic of Ethiopia, emphasized the importance of agriculture as the driver of the economy in Ethiopia. He stated that 41% of Ethiopia’s GDP, 90% of exports, and over 80% of employment in Ethiopia was dependent on agriculture. “Our focus right now is to transform our agriculture and make Ethiopia not only food secure but also nutrition secure,” he said. 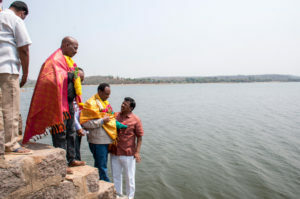 The delegation visited the site of Mission Kakatiya, a flagship project by the state of Telangana to rejuvenate water bodies in the state. They looked at how irrigation infrastructure development could contribute to better livelihoods for small and marginal farmers. About 66% of arable land in Ethiopia lies untapped by irrigation, which could be made productive to make Ethiopian farmers more resilient. Being welcomed with dazzling shawls and garlands, and treated to traditional dance/drama performances by local artistes was just one part of an exciting and eventful trip for the visitors. At ICRISAT’s Agribusiness and Innovation Platform the delegation looked at how agri-based small and medium enterprises could be encouraged for a ready and sustained market for agricultural produce. Ethiopian agriculture policy makers are striving to move from a production-oriented mindset towards a market-oriented one to support smallholder farmers with a sustainable, profitable market. The Ethiopian delegation interacts with local farmers. The team interacted with farmers and officers at Mulkanoor Cooperative Rural Bank – a 60-year-old financial institution that provides loans, welfare schemes and assistance to farmers in Karimnagar, Telangana. This helped them understand how the Cooperative used digital technology and agribusiness ventures. The delegation also explored areas of collaboration on farm mechanization with the National Academy of Agricultural Research Management (ICAR-NAARM) – an institution of the Government of India, for scientists and farmers in Ethiopia through e-learning. Making a special mention of ICRISAT’s expertise in drought management and drought-tolerant crops, the Minister said that they were very interested at the Smart Food approach of building demand for these crops by collaborating with food processors and the food service industry. He hoped that the Smart Food concept could be replicated in Ethiopia too. Expressing happiness at finally being able to visit ICRISAT – ‘a dream come true’ for them, he hoped that the Ethiopian Government and ICRISAT could work towards a fruitful association in the coming years. The delegation, which included HE Mr Tesfaye Mengiste Dori, (State Minister, MoANR, Ethiopia), Dr Diriba Gelete Chali (Deputy Director General and Acting Director General, Ethiopian Agricultural Research Institute), and other senior officials, visited ICRISAT from 8-12 March 2018. 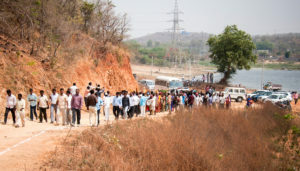 “Compared to the local groundnut variety, I earned INR 2,000-3,000 (USD 31-46) more per acre from the new improved variety ‘Devi’,” says Bhubaneswar Biswal, a farmer group leader from Kalahandi district in Odisha, India. Groundnut is an important cash crop for Odisha state. It is cultivated on about 280,000 ha and is a key crop supporting crop-livestock production system. Rich in protein and edible oil, groundnut is also important for the nutritional and financial well-being of farmers and consumers. 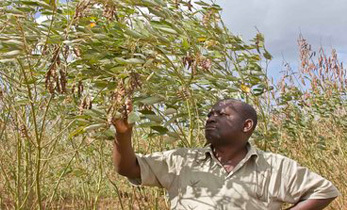 Yet, farmers have been facing a major problem in terms of accessing quality groundnut seeds. To tackle the issue of quality seed availability and to strengthen the local seed system, about 4,000 kg breeder seed of ICGV 91114 (Devi) and ICGV 00351 were supplied by ICRISAT during 2017 to the Odisha State Seed Corporation Limited and the National Seeds Corporation, respectively to produce foundation seeds. Threshing, a laborious post-harvest activity, involves separation of pods from the groundnut haulms. This key activity is cost intensive and is often challenged by shortage of labor availability during the peak season. To tackle this challenge, ICRISAT introduced dry plant threshers in Ganjam and Bolangir districts of Odisha. The results from the farmer’s fields indicate 50% reduction in cost for threshing when dry plant threshers are used as compared to manual threshing. Over a span of 6-7 hours, the machine can thresh two hectares of groundnut plant (about 3,500 kg). Small heaps of plants are dried by keeping plants upside down to ensure easy threshing. This practice also contributes to better quality pods as they are away from the soil during the drying process. From this successful pilot, the use of threshers will be scaled out in 12 major groundnut-growing districts (Jajpur, Jagatsinghpur, Balasore, Kendrapara, Dhenkhanal, Gajapati, Puri, Cuttack, Naupada, Ganjam, Kalahandi, Bolangir) of Odisha. As creating awareness and training on new technologies is an essential part of scaling out, ICRISAT recently conducted a one-day training program on ‘Opportunities for Mechanization of Groundnut Production in Odisha’. While interacting with farmers, Dr Pradhan from Farm and Implements Unit of the Orissa University of Agriculture Technology (OUAT) discussed the importance of using seed drills to ensure line planting to facilitate inter-cultural operations, plant diggers, decorticators and graders. Dr M Muthu Kumar, Director of Agriculture and Food Production, Government of Odisha, described the collaboration between ICRISAT, the Department of Agriculture, and OUAT in piloting the dry plant threshers in the state as a critical move to strengthen the groundnut seed systems. He emphasized on the need to mechanize groundnut threshing as it is highly labor intensive. Generally groundnut seeds are prone to quality deterioration and damage due to improper storage. 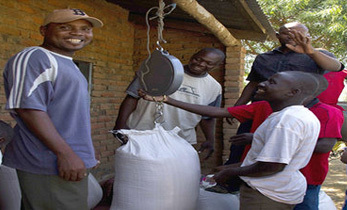 Purdue Improved Crop Storage (PICS)-based triple layer plastic bags can be used to store groundnut pods without loss of viability for a period of eight months. “This cost-efficient environment-friendly technology is of immense help to farmers as they can now save and reuse their own seeds for the next season. It helps regulate moisture content and insect activity. The PICS bags can not only protect the pod quality but also prevent aflatoxin contamination,” explains Dr Hari Sudini, Scientist- Groundnut Pathology, ICRISAT. 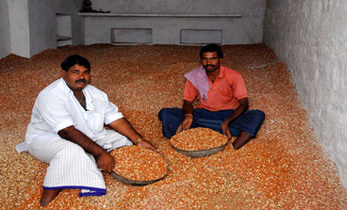 “It is not possible to supply seed for all the cropped area of groundnut in Odisha as it requires huge quantities of seeds, approximately 30,000 t to plant 200,000 ha. Even at 150 kg per ha and an average yield of 1.7 t per ha, an area of 18,000 ha has to be planted for seed production. Therefore, farmers are encouraged to save and reuse seeds as an alternative, provided good storage options are available,” adds Dr P Janila, Principal Scientist – Groundnut Breeding, ICRISAT. Dr Swain Braja presented the opportunities of using groundnut-based feed and fodder to increase livestock productivity. An earlier study on the same subject conducted in Anantapur, Andhra Pradesh, indicated an 11% increase in milk yield when groundnut haulms of the new variety Devi (ICGV 91114) were fed to cattle. 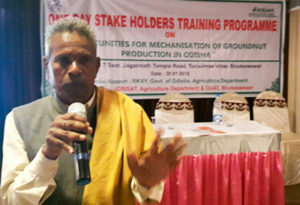 The training program was conducted at Bhubaneshwar for members of the Department of Agriculture, Government of Odisha; NGOs; Farm Engineering Department, Government of Odisha; fabricators; National Seed Corporation; Odisha State Seed Corporation Limited; faculty members from OUAT and eight farmer group leaders. A total of 61 participants were trained. India’s apex rural bank and the international crops research institute explored science-driven digital technology options to transform the rural sector. In a unique initiative, ICRISAT ihub, an incubator for agri-tech entrepreneurs, conducted a three-day training for senior officials from the National Bank for Agriculture and Rural Development (NABARD), India’s foremost financial institution for sustainable and equitable rural development. More than 50% of NABARD’s senior staff trained at ICRISAT are trainers themselves, who are a significant link in scaling-out Information and Communication Technologies (ICTs) and the benefits of digital agriculture across India. Digital technologies for agriculture can be a promising pathway for smallholder farmers to make farming more profitable. It is therefore critical to scale-out proven digital technologies to engage every farmer. The training on ‘Digital Agriculture and Internet of Things (IoT)’ took place from 12th to 14th March and was significant because capacity and skill building focused on ICTs to increase income and attract youth is one of the priority areas for NABARD. During the training, ICRISAT scientists presented climate-smart agriculture using geographic information system, remote sensing and climate models. Partners discussed real time applicability of ICTs, precision agriculture and IoT. Digital technologies have the potential to positively transform agriculture by delivering need-based context-specific and timely information to smallholder farmers. With the help of ICT, farmers can better manage risks (climate, production and market risks). 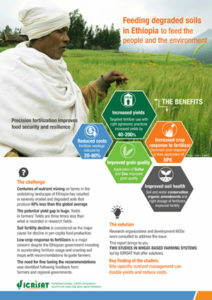 By using the Sowing App developed by ICRISAT and Microsoft, 150 farmers increased their yield by 30%. “Farmers can also opt for ICRISAT’s intelligent agricultural systems advisory tool (iSAT), a Big Data-driven technology and receive a whole range of farming advice through text messages in their language automatically every week throughout the cropping season,” says Dr Dakshina Murthy Kadiyala, Senior Scientist-Systems Modeling, ICRISAT. The potential for digitizing agriculture is huge. 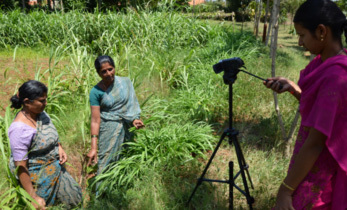 ‘Kalgudi’, a social media platform for information exchange in the local language connects one million farmers with agriculture value chain stakeholders. ‘Khetinext’ digital platform connects 30,000 farmers directly to quality inputs, consumers and financial institutions. Through Khetinext, farmers could reduce input costs by 30%. ‘Kisan Raja’ an innovation that allows farmers to remotely control agricultural motors to manage water more efficiently was demonstrated during the training. “We are happy with the training and would like to organize a series of knowledge transfer sessions with ICRISAT to our staff and partners,” says SK Jahagirdar, senior faculty from NABARD’s National Bank Staff College in Lucknow and a primary initiator of the training program. In the past, ICRISAT and NABARD have worked to enhance technical capacity of stakeholders in agribusiness. 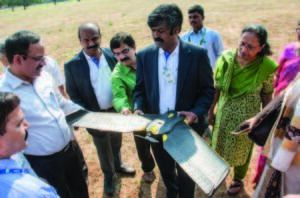 While NABARD has expressed interest in collaborating with ihub partners, this unique and successful training initiative may have set off a trajectory for a strong partnership with ICRISAT. The Nigerian Federal Government is set to elevate the status of local farmers in the country from subsistence to a commercially oriented farming through its Agricultural Transformation Agenda Support Programme Phase I (ATASP-1) project. The country representative of the International Crop Research Institute for Semi-Arid Tropics (ICRISAT), Dr Hakeem Ajeigbe disclosed this at a 2-day zonal meeting of the Kano-Jigawa Staple Crop Processing Zone, held in Kano. No fewer than 2,520 farmers from Kano and Jigawa states will benefit from the Agricultural Transformation Agenda Support Programme phase-one (ATASP-1). Farming systems in Ethiopia are plagued by soil-related problems which lead to poor productivity, declining soil fertility and soil erosion. Other common farming-related challenges include low fertilizer use and reduced farmlands because of population pressure. Government efforts to address these problems by importing fertilizer, creating a soil fertility atlas, and setting up fertilizer blend plants, have not led to significant increases in crop production in rural areas. 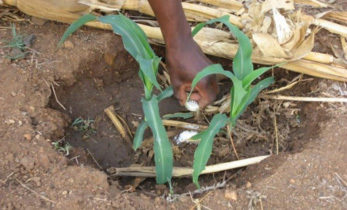 A recent study by the International Crops Research Institute for the Semi-Arid Tropics (ICRISAT) in the Africa RISING research sites in Ethiopia shows that site-specific nutrient management, which combines plant nutrient requirements at each growth stage of a crop and the soil’s ability to supply those nutrients, could increase food productivity in the country. Dr Hari D Upadhyaya, Head, Genebank, ICRISAT, highlights the importance of conserving crop seeds for the future generations. He was recently awarded the Crop Trust Legacy Award for his work on crop diversity. 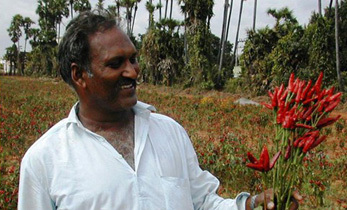 Read more here about his work in the area of preservation of important crop seeds. Abstract: Fusarium wilt (FW; caused by Fusarium oxysporum f. sp. ciceris) and Ascochyta blight (AB; caused by Ascochyta rabiei) are two major biotic stresses that cause significant yield losses in chickpea (Cicer arietinum L.). In order to identify the genomic regions responsible for resistance to FW and AB, 188 recombinant inbred lines derived from a cross JG 62 × ICCV 05530 were phenotyped for reaction to FW and AB under both controlled environment and field conditions. The QTLs and linked markers identified in this study can be utilized for enhancing the FW and AB resistance in elite cultivars using marker-assisted backcrossing. Abstract: Terminal drought stress leads to substantial annual yield losses in chickpea (Cicer arietinum L.). Adaptation to water limitation is a matter of matching water supply to water demand by the crop. Therefore, harnessing the genetics of traits contributing to plant water use, i.e. transpiration rate and canopy development dynamics, is important to design crop ideotypes suited to a varying range of water limited environments. With an aim of identifying genomic regions for plant vigour (growth and canopy size) and canopy conductance traits, 232 recombinant inbred lines derived from a cross between ICC 4958 and ICC 1882, were phenotyped at vegetative stage under well-watered conditions using a high throughput phenotyping platform (LeasyScan). Abstract: The purpose of this paper is to examine the effect of input credit on smallholder farmers’ output and income using Masara N’Arziki support project in Northern Ghana. A cross-sectional primary data set was used to estimate the effect of project participation on farm output, yield and income using propensity score matching (PSM) methods. The findings are that project participation is skewed towards experienced farmers with big-sized households and farms. The effect of project on outcomes is somewhat unsatisfactory in the sense that participation only raises output and yield, but not income. Authors: von Wettberg EJB, Chang PL, Başdemir F, Carrasquila-Garcia N, et al. Abstract: Domesticated species are impacted in unintended ways during domestication and breeding. Changes in the nature and intensity of selection impart genetic drift, reduce diversity, and increase the frequency of deleterious alleles. Such outcomes constrain our ability to expand the cultivation of crops into environments that differ from those under which domestication occurred. We address this need in chickpea, an important pulse legume, by harnessing the diversity of wild crop relatives. We document an extreme domestication-related genetic bottleneck and decipher the genetic history of wild populations. Abstract: This book contains 15 chapters assessing key research on particular types of grain legumes, such as common beans, chickpeas, lentils, soyabeans, groundnuts, cowpeas, faba beans and pigeon peas. Information on the development of improved cultivars as well as improvements in cultivation techniques of these grain legumes are also presented. Published: 2018, In: National Conference on Agriculture 2022 – Doubling Farmers’ Income, February 19 – 20, 2018, New Delhi, India. Abstract: The Indian economy is largely agrarian, with around 55%of the population dependent for their livelihoods on agriculture and allied sectors that generate 15% Gross Value Added (GVA) (Gol 2017a). Indian farmers are vulnerable to impacts of climate change, water scarcity and land degradation. In addition, increasing fragmentation of holdings, extreme weather events, rising input costs and post-harvest losses pose an enormous challenge to sustaining agricultural growth. There has been considerable expansion and change in the research and extension system but the key questions remain: ‘Is this sufficient to Double Farmers ’Incomes by 2022? Is there a need for a different mindset to ensure agriculture science empowers farmers to reach their full economic potential? Can such be achieved while delivering nutrition to the nation as well as within the ecological boundaries of India’s natural resources? Abstract: The decision by the Government of Kenya in 2013 to increase tax revenue by imposing excise duty of 50 percent on sorghum beer resulted in economic losses for smallholders, the brewery, and the government itself because it effectively killed the value chain. In 2015, the government reversed the policy decision and reduced excise duty to 10 percent. The purpose of this paper is to analyze the impact of this policy decision on the value chain, adaptation by growers and the brewery, and the rationale for this policy change and its reversal. The author shows how the nature of politics in Kenya exposed the value chain to endogenous shocks as the result of conflicts between interacting agents, where smallholder farmer organizations were important for successful adaptation. Abstract: The purpose of this paper is to introduce a new conceptual framework for smallholder value chains based on complex adaptive systems. The authors review the application of the framework to three case studies and explore their implications. The authors reflect on the value of a framework based on complex adaptive systems compared to alternative frameworks. The authors argue that the dynamics of smallholder value chains have received insufficient attention. By focusing on these dynamics and on the capacity for adaptation among value chain actors the framework provides a new perspective on smallholder value chains. Complex adaptive systems provide a useful framework for analyzing value chain dynamics. Abstract: Smallholder value chains are dynamic, changing over time in sudden, unpredictable ways as they adapt to shocks. Understanding these dynamics and adaptation is essential for these chains to remain competitive in turbulent markets. This paper develops an expanded conceptual framework to understand value chain performance based on the theory of complex adaptive systems. The framework combines seven common properties of complex systems: time, uncertainty, sensitivity to initial conditions, endogenous shocks, sudden change, interacting agents and adaptation. The authors outline how the framework can be used to ask new research questions and analyze case studies in order to improve our understanding of the development of smallholder value chains and their capacity for adaptation.